The Legend of Zelda: Breath of the Wild is packed with secrets and hidden features, some of which are so subtle you may not even notice them until you've passed 50 hours of gameplay (like us). Star Fragments are one such element; these are precious items which fall from the night sky and can be used in some unique ways. Despite their elusive nature it's possible to farm these rare drops and therefore get some of the best gear - and we're going to show you how it's done. It's possible to farm Star Fragments at a rate of about one every five to ten minutes. First off, visit any location where you're able to catch some sleep (a fire or cooking pot outside a stable is a good choice, because it's free). Sleep until morning and then manually save your game. Once you've done this, press the Home button and close the game down entirely. Open it up again, re-load your save and then sleep until night. Once you've done this, teleport to a high location - in this case, we're using Shee Vaneer Shrine on the Duelling Peaks. Once you're up there, make sure you've got some warm clothing on as it's quite cold. You may also have to deal with some enemies as well. 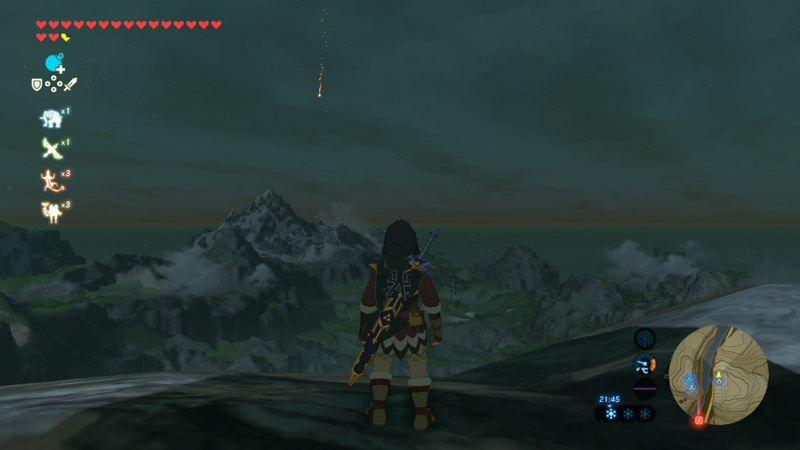 When you have the mountain top to yourself, look towards the east, in the direction of Hateno Tower. In-between the hours of 9PM and 12PM, you should see a shooting star drift in from the top of the screen. Watch where it lands - once it hits the ground it will emit a shaft of light. Use your scope to pinpoint the precise location and lay a marker pin which will show up on your mini-map. Once you've done all of this, either paraglide off the top of the mountain towards the pin, or teleport to the nearest Shrine. You can repeat this process as many times as you like; shutting down the game and restarting it appears to reset the game's internal clock, allowing you to get more Star Fragments than you would via normal play. There are three main uses for Star Fragments once you have them. First up is their resale value; if you're looking to raise some cash quickly then you'll be pleased to learn that they're worth 300 Rupees each. You can also use them in cooking, but we'd advise against that - the effectiveness of the resultant dishes isn't all that great compared to the mighty Hearty Radish, and while you can sell the meals for a handsome profit, it's not really worth the fuss. The third and final use for the Star Fragments is upgrading certain items and armour sets (mainly those gained by using amiibo) to their maximum, which you'll need to do by visiting one of the four Great Fairies in the game. Star Fragments are quite a useful item to get hold of, especially if you need to raise a lot of money. It's a shame that they can't be used to enhance more items - those of you without amiibo may not see the point of collecting them - but they're worth grabbing whenever they appear. Freaking star fragments have been the bane of my clothes upgrading existence! I've tried doing something similar to this after watching youtubers but it didn't work. I am now going to follow these exact steps and hope for the best. Thank you for this! No lie, last night I was like, hmm I need to find more star fragments. I've played nearly 200 hours and only found the Coliseum the night before last despite only being just off the Great Plateau. And last night, I finally went to see Impa. I should have gone long ago. I've missed out on so much as a result. You played 200 hours and only now saw Impa?! You certainly know how to keep a lady waiting. I can't say I am impressed with how they were handled. Feels very very dull. I just sell them whenever I stumble across one since I don't care about upgrading my clothes. Other than I looked towards Hyrule Castle, this is the exact same method I use. Except I wait between 21:00-02:00. I spent 8 hours alone to figure out this method myself. Very effective method, but not exactly out there in my opinion. I'm not reading this guide as I've yet to collect one,i'd rather find out for myself. I've only made a point of going after one once and I was so close to collecting it.I had to scale a huge cliff to get it but when I made it to the top I was knocked back off the cliff by a Blue ChuChu of all things.I climbed all the way back up but just as I made it to the top the star fragment disappeared in front of my eyes. Doesn't it also need to be a full moon night for a shooting star to appear? Why isn't this mentioned? @cowntsikin It doesn't matter what type of moon it is. It should be noted that you do not need amiibo to unlock the "Wild" tunic set. @cowntsikin It can be any type of moon. Cmon Ninty bring out MM and SS amiibos! @SLIGEACH_EIRE Yeah, while wandering around and exploring are fun, I don't recommend beginning that until after the whole Hateno village quests. Once you have your final rune, that's a good time for it. 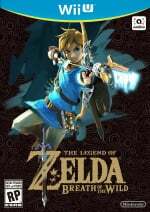 Is the time elapse on Zelda BotW = Real time here ? Like Animal Crossing time ? I'll give this a shot. I have a ton of amiibo clothing upgrades I need to make and no star fragments. 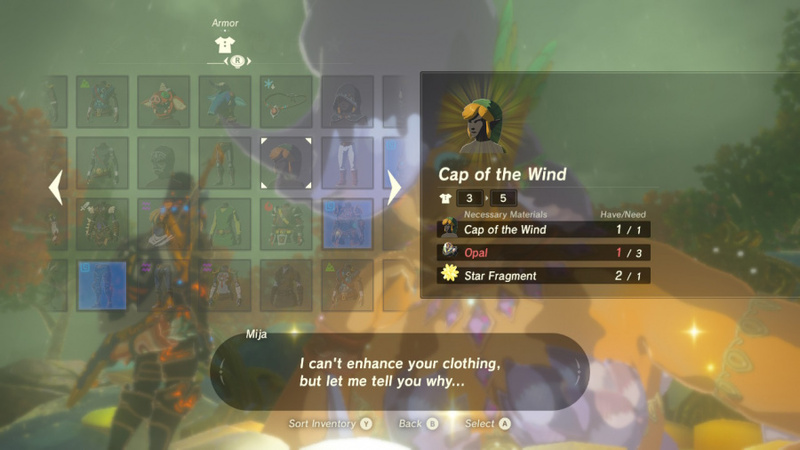 Why does this guide say the "Cap of the Wild", Tunic of the Wild" and "Trousers of the Wild" are amiibo items when it's NOT in any way possible to obtain these items from any amiibo? Yo, you actually get the "of the Wild" armor set items for completing all 120 shrines. @Anti-Matter No, more like, BotW minutes are seconds, and hours are minutes. So basically, 1/60th time. So the big question is: How do farm star fragments when NOT doing the kind of cheat-ish restart of the game? I'd much rather do in-game things. I never used my Game Genie for the original LoZ either. It's just a thing I do. @NEStalgia I have gotten a few by waiting for a full moon but it isn't 100percent. I'm going to try the turn off option to see if I can farm them every time. Oh good! I needed this guide. I love the amiibo outfits, but I'm sad you can't change their color. I wanted to do a classic Link with purple hood and red tunic. So do we have to wait until nightfall or can we sleep until night? Damn! I saw one of these in the sky and never found it! I was only 20 hours in! @JHDK I've had trouble tracking them down even when following these steps to a tee. Placing a marker is kind of a guessing game as well considering you sometimes can't actually aim at the ground it landed on. Just make sure you scoure the area methodically. I've gotten a few to upgrade to 4 star on my ancient set. For rupees I'd rather farm shards of Farosh's horn. Can get 300 rupees every 2 minutes. 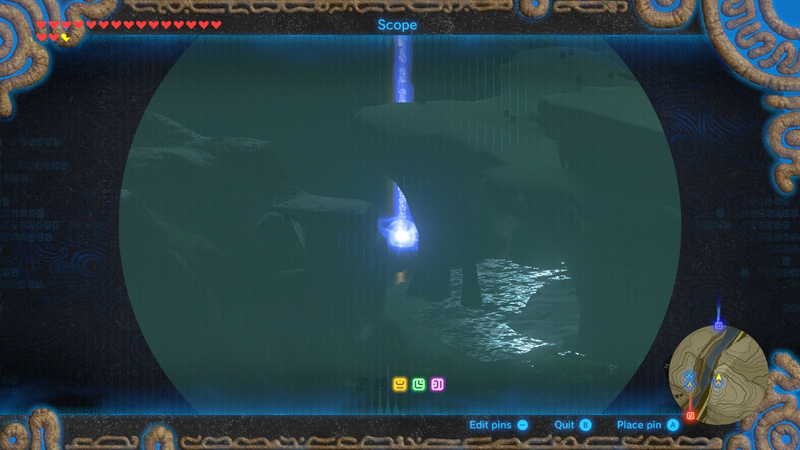 He spawns over Lake Hylia at 5:10 am. I shoot his horn, go back fire and wait for the next morning, he spawns immediately, and keep repeating. When I'm done I go collect all the shards as they don't despawn. Just bring a bundle of wood and fire arrows or flint. Also, if you make the fire at the foot of the bridge under the arch you won't have to worry about rain keeping you from building a fire. 2) Build fire; time skip to morning. You must do this first before step 3 every time. 3) Rekindle fire; time skip to night. Wait for star to fall, go collect the Star Fragment. This is a far more efficient method. It works without fail every single time (unless the star piece falls into water). Try it!!! Need them for my ancient set, thanks guys! One of my biggest gripes with the game is that there was no way to craft, or have a blacksmith make, weapons for you (save for a few specific ones). Some materials have too few uses in my opinion. It felt a little pointless to get Opals and Ambers etc. as rewards when you can't do much with them for the majority of the game. @SLIGEACH_EIRE You did visit Hateno Ancient Tech Lab and got the Rune there though, right..? I wondered where you got them from!! I've only found one so far, and I think it was given to me at a stable? Had no idea they fell from the sky but makes perfect sense. I'll keep my eyes on the skies now. @Billsama Good thing I'm not a reviewer because I'd tear games rear ends apart with this crap. 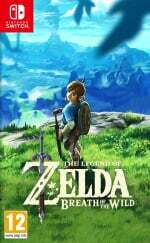 BOTW could be perfect but I'd drop a point just for that. @Moshugan I'll be honest: as soon as I see the word 'craft' in a games blurb I put it back on the shelf or don't bother downloading it. The most overused game mechanic since QTEs. I only ever liked 2 games crafting mechanics: Final Fantasy VIII (which had one way before it was vogue) and Minecraft, because it's kind of the point. @Moshugan Couldn't do that until I met Impa. @Andyv01 A good song subtitle would have been "Waiting for a Star to fall". It's too late, they missed the trick. 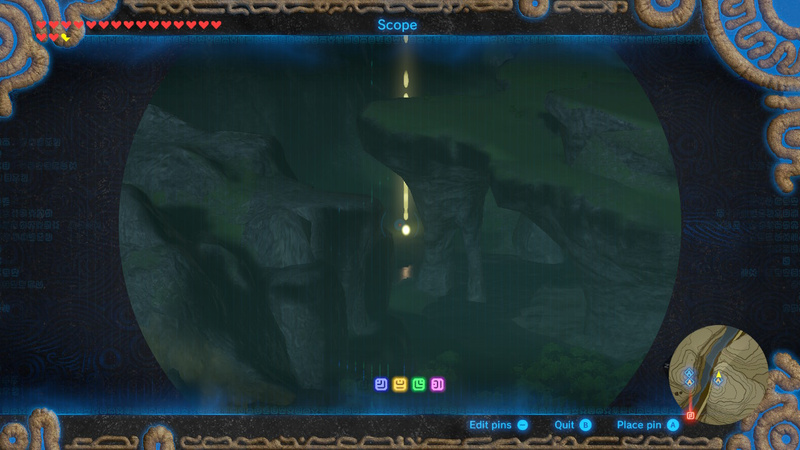 Just don't be looking toward Lake Hylia when you do this. Well, this is considerably better than just getting lucky. Still, this is gonna take a while - I've got all the amiibo clothes so far. These guides are so helpful. Keep doing these please! Been working through these lately... just got the jewellery and Sheik's Mask left to upgrade... there are a few things missing from this list, and it doesn't give an indication of how many you need for each... you will be at it for a while. 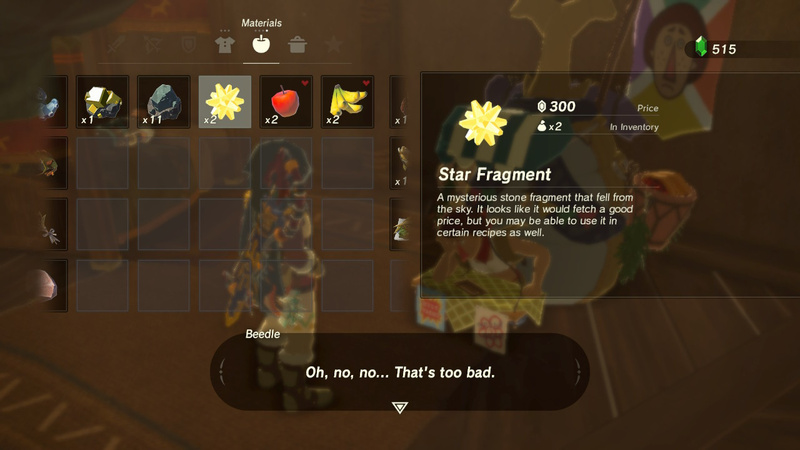 You can also get Star Fragments from Silver Lynels as well if you're lucky... as well as from a few quests, chests, etc. I did this step for step and it didn't work. I'm sure it's being shown on the Switch and I've been playing on the WiiU, so that may make a difference. I'm not sure. I'll be darned, worked like a charm. By far the best method I've seen yet. The only downer is that when it lands on a hillside, it naturally starts falling when you draw near. If it lands in deep water, it will sink. I gotta say, this trick didn't work every time, but it worked enough. I had the most luck following the instructions to the letter. Such as when you load you saved file, not even pressing A for tips. 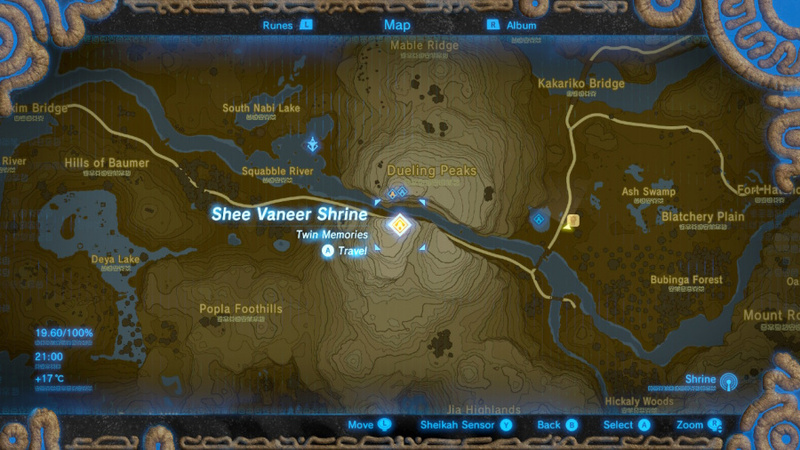 Also, it worked best for me if I perched on a cliff near the shrine they mention, drop some wood and start a fire from there. The star can fall right at 9 and that's not enough time to warp someplace and get to a high place. Good luck! I shouldn't have looked at this because now I want all these armour sets! I feel like cracking open my hero of time Amiibo just to see the set that it might give me! This game is the best. Im gonna play it right after I've done some housework! I've noticed if you can save your game upon waking in the morning, like right after before the game can auto-save, this trick works every time. Trousers of the Wind....reminds me of a guy I used to work with. I've just been killing Silver Lynels hoping i get lucky. Finally something that works!!! Many thanks NL!